The west coast of Michigan, from New Buffalo up through Empire, is known for its sand dunes. 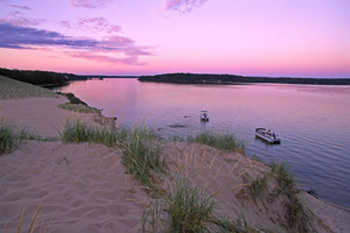 But even Hamlin Lake, just north of Ludington, has sand dunes that people love to visit... by boat or by car! Located on the northwest section of the lake, you can climb the dune (which is within the Ludington State Park) and see Lake Michigan on the other side. Many take their boats or jet skis and anchor them on the beach at the base of the dune. It's a popular destination for those who want to spend some time on the sand, lying in the sun or enjoying a picnic. On the southwest side of Hamlin Lake in the State Park you can climb Mt. Baldy. It's quite a trek, but once you reach the top you'll experience terrific views of Lake Michigan. Be sure to visit the Ludington State Park, even if you're not camping. It offers so many fun activities for people of all ages. Take a hike out to Big Sable Point Lighthouse and climb the 112 foot tower. It's open daily from 10am-5pm; donation is $3. Remember your visit with a souvenir from the gift shop, located in the original Keeper's Quarters. Hike or bike on the various trails that meander through the park, swim at Hamlin Beach, or take a relaxing tube ride down the Sable River. By the end of the day you'll be exhausted from all the fresh air and fun...the way it should be. Nothing feels better than being outdoors and taking advantage of all Mother Nature has to offer. Hamlin Lake...with its resorts, boating, and fishing...is THE place for fun in the Ludington area. And don't forget to check out the sand dunes that tower over the lake. They're an adventure in itself! Check out Boating & Fishing on Hamlin Lake, and more Things To Do in the Hamlin Lake area. If you plan to stay on Hamlin Lake, check out Lodging options including cottages and rental homes.